No man can fathom the height, depth, and intensity of God’s love. He created the universes and galaxies and yet mankind will always be the recipient of His magnanimous love. He created man to steward all creation, great and small, and also to fellowship or commune with Him. He is a relational God, a personal God who always wants to speak with, engage with, and be with humans. For six thousand years since the creation of everything, God has been providing, protecting, pursuing, and loving mankind. We all know the Genesis account of the fall of man where the first couple fell into sin where the corruption of man and this world began. Man used to be perfect but this sin of disobedience nullified it. Time and time again, God loves us despite of many things that we have done against Him, against ourselves, and against other people. Even if we are doing the right things at the right time at the right place with the right people, we do not have it all together. We are finite beings with all our imperfections. God is the only perfect being without sin and error. With that being said, we need to stop forcing ourselves to be perfect. Of course, we should not sin or disobey intentionally but we need to fully comprehend God’s love for us. We all have past failures and mistakes. Our life history is replete with trials, pains, heartaches, struggles, and challenges. We can never change our past but we can allow God to work right now to bless us currently and our future. God just keeps loving us, forgiving us, and understanding us. He is the most loving, forgiving, and understanding being you will ever have in your life. There are moments that we become faithless people. We lack the faith to believe God for the impossible. 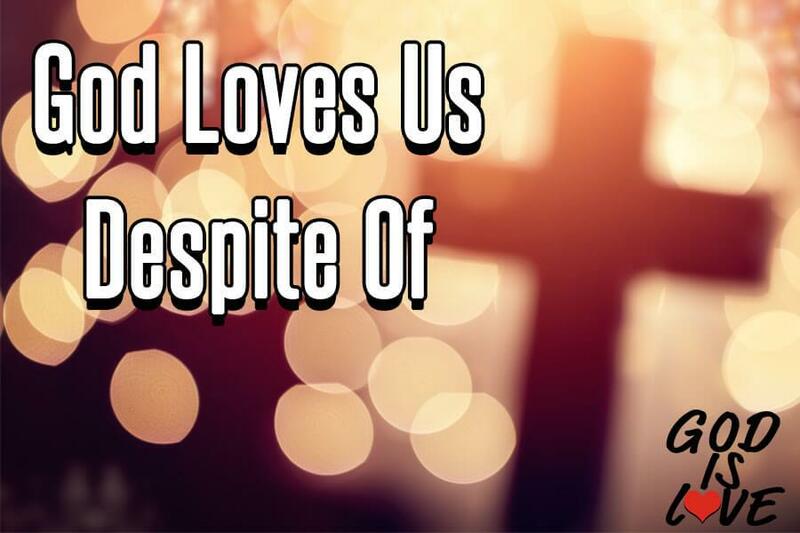 Despite that, God is love and He loves us. We may not exactly understand the purpose of our trials and tribulations. Rest assured, God is faithful even when we are faithless. Our prayer should be for God to increase and activate our faith. The men and women in the Bible who achieved great exploits are those with great faith. By now, you know how magnanimous His love is and that no matter what we do and how we perform, He still loves us despite of. All we need to do is to surrender our lives to Him, obey Him, and most of all, love Him back. Our mission at God is Love Clothing is to spread the love of God through Christian apparel. We cannot always hold banners and speak with all people we meet about God but we can freely wear and say it through our clothes.